So I put up a writing prompt on reddit, but gave it a go myself. Here's a short version. Have more to add, but this will do for now. Allons-y! From the start, the two fit together like a couple of puzzle pieces, the ones you have to force just the tiniest bit to get right. They met at a rooftop bar in Beijing. Him, an American backpacking the world; her, a British language immersion student. You crossed my mind earlier, so thought I’d see how you’re doing. Hope you’re well. Happy Hanukkah and best wishes for the new year! She’d read over their old messages before she sent it. They took her to a place her emotions seldom permitted her to stay for any length of time a “normal” person would deem acceptable. Thing is, she was not one of those people; the only possible way she could think to describe her present state – one of nostalgia, regret, lust, and a host of other feelings related to missed opportunities… opportunity - was unmerited saudade. She was usually terribly logical when it came to men, something she was only now coming to realise had been quietly deleterious. Seeing her interact with the most recent victim to pique her interest was witnessing a master perform an oft-practised, long-perfected skill. At anything beyond the coquettish façade, she was inept. It was her fault nothing had happened between them, certainly not for his lack of trying nor her lack of attraction. Their flirting was a social contract she was scared to sign. He would have signed it with his lips the day they met; she knew, because he had told her as much. He continued his travels, she continued her studies. They kept in touch. His intentions were clear, hers slightly more opaque. He asked her to come see him. She looked at tickets. He invited her to join him. She considered she might enjoy being in his debt. He invited her again. She proffered reasons she could not – though unbeknownst to him, begrudgingly. The invitations stopped. Their lives continued. Two years after an invitation to spend New Year’s Eve as his date, she thought of him. He was now on his second post-graduate degree, she had finished her studies for the time being, and was kind of working, kind of doing her own thing. She quickly typed an email, and hit send – this time, her intentions more conspicuous. They had adventures, but not together. While not usually one to toot my own horn, my near-expert knowledge and high skill level in the area of procrastination have "inspired" a midday musing. I'm definitely not avoiding work. As I write this, the degree classification I will receive in two months time is heavily dependent on the work I am able to produce in the next 4-5 weeks. Why then, am I updating my blog?! Because, like many other students, I find that the size of my to-do list is inversely proportional to the amount of time left until my deadlines/exams. As this list is quite nicely detailed, it seemed almost cruelty not to share it for others to use as a guideline for their to-do lists. crochet some Granny squares just to "try that thing I saw on Pinterest"
go over the Nage-no Kata as "it's been a while"
Naturally this is just a starter list for beginners. They get longer and more detailed the more proficient you become at making these sorts of lists. ...I beg of you don't use that as a to-do list template! #failedit would likely be a much more fitting hashtag if that's how I tried to fill my days in the weeks leading up to graduation. With the exception of one or two of the points above*, any attempt at completing that list would simply leave me busy, but not productive. Short and sweet; nothing to hide behind. We so often try to overcomplicate things that should be simple. Of course this is much easier said (or written) than done. Often the pull of Reddit, Buzzfeed, Pinterest, Stumbleupon, Twitter, Facebook, and Youtube to name but a small few (yet major offenders - for me at least) are strong. It's just easier to not look at the calendar and pretend that any deadlines are forever away. It can be difficult, but sometimes you just need to turn off the computer, leave the room, and sit down with a quill, inkpot, candle, and scroll (or pen/pencil and paper if you're not feeling fancy) and do work BY HAND. *cue scary music/screams* If you just can't do without your computer, you can use something like the StayFocusd extension in Chrome to at least limit the amount of time you can spend on the aforementioned sites. It even guilt-trips you when you try to up the amount of time you have each day on blocked sites. So as not to encourage the continued putting-off of work (yours and mine), I'm going to wrap up here for today, leaving you with a piece of advice and three quotes - at least one of which you've probably heard many a time over the course of your life - to help get you on the road to recovery. If it will take you less than five minutes, do it right away. - Such a good habit to implement. Start small with things like making your bed every morning, washing, drying, and putting the dishes you just used, and see how you begin to incorporate it into different aspects of your life, and the impact it has on your productivity. So go purge your own to-do list, and get cracking! NB: I'm on to you; don't take an inordinately long amount of time writing the list in an effort to procrastinate further! 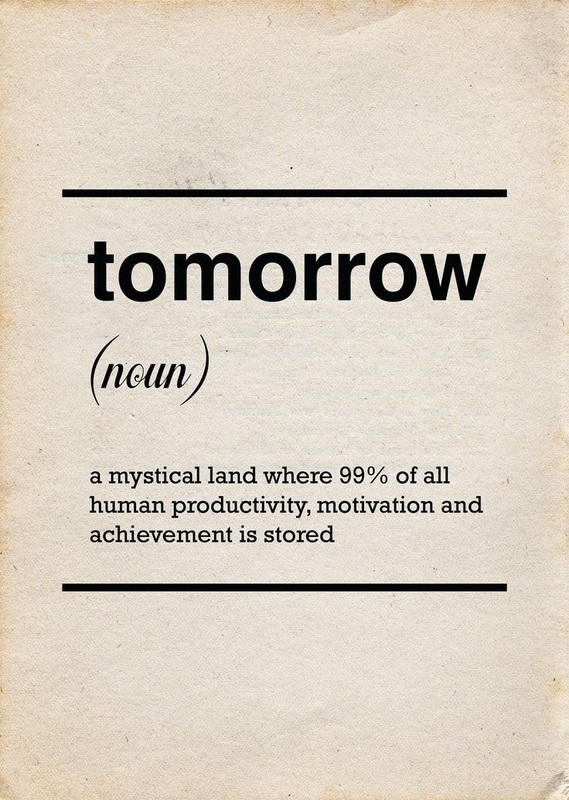 Maybe don't even write one at all, just start (now, not the tomorrow defined above). * What can I say, snacks are important! Why start a new blog when I'm barely posting on the other ones? As a student in the last few weeks of final year, as well as being someone founding a company, time for writing non-degree related pieces is scarce. My brain however, doesn't quite seem to get that, and sometimes goes a bit wild coming up with [short] story ideas, poems, prayers, hypothetical conversations, songs, and general musings. As these are just the paths my brain decides on its own to wander, my feeling is that they don't need to have as much structure and polish as an entry on one of the other blogs, requiring less time, but still allowing me to put things up for your reading enjoyment. The best things come to you in the middle of the night when you have so much to do that you just want to take a nap, you haven't slept more than 3 or 4 hours a night in weeks, have a 4,000 word deadline in a few hours, and consider vanilla ice cream and Cheerios an acceptable breakfast, hence the title. 'Tis the story of this new blog - Mid-night Musings of a non-sequitur.